It’s a busy time of year, what with Christmas coming up and my friend Stacy getting married on January 2. I have a long list of things to do, and a growing panic that I won’t get everything done. I don’t really have time to sort through all the weaving things I bought last weekend, but I have not been able to entirely ignore the siren call of my new storage unit. I’ve gone twice, for about 1/2 hour each time. I started cleaning the dust off the Macomber loom. I looked through 2 boxes of books and selected a few to bring home now (more on this in another post over the weekend). I sorted through a basket full of miscellaneous tools, most of which were shuttles of various types and sizes. In the basket of miscellaneous tools, I found four variations on a tool, but I don’t know what it is. At first I thought that they were pieces to be assembled into something else; now I think they are their own thing. But I don’t know what that thing is. Can you name that tool in three pictures? Here they are in the closed position. The right-hand metal band on each piece slides down so that the middle piece can be folded out. Here’s what they look like in the open position. When the middle piece is folded out, you can see that it has holes drilled all along it. I’m not sure if the eye hooks come out so that you can move that middle piece so it will be a different length. I was afraid I would break the tool if I tried to remove the eye hook, so didn’t play with it at all. On the back side, the tools have sharp pointy teeth at each end. It was these teeth that made me think that these were parts of a larger object. 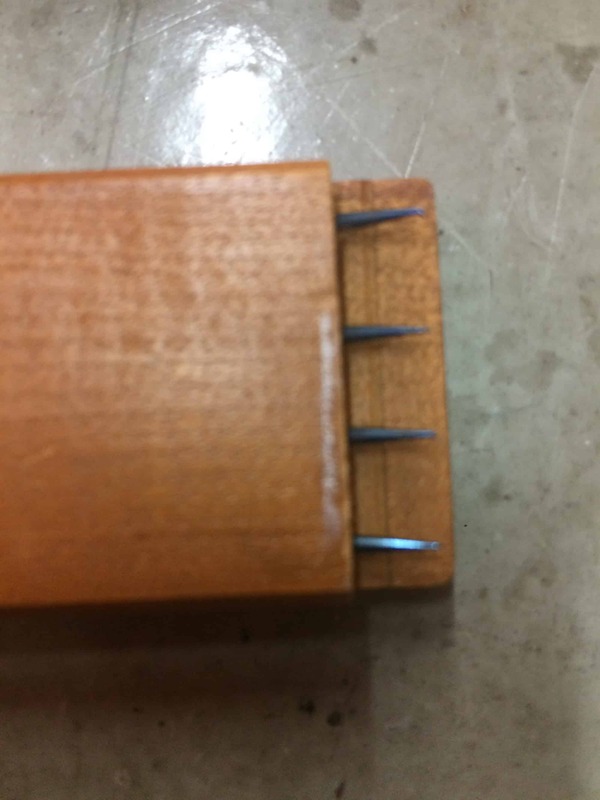 I thought they were fasteners to connect two pieces of wood. The only reason I’m thinking each might be an individual tool is because so far I haven’t found any other parts that seem to attach to these. The four items are all different sizes and different brands, so they do not attach to each other. I do have two or three bundles of long pieces of wood that I haven’t yet unbundled. 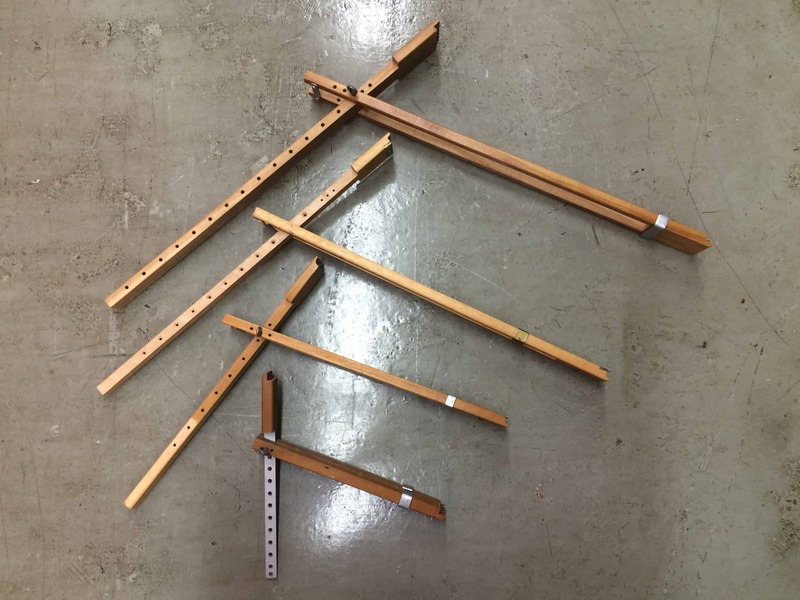 The cursory glance I gave those bundles when we were loading and unloading the van led me to believe that they are full of warp sticks and lease sticks, but it’s possible that I might find pieces that belong with these four mystery pieces. Since I don’t know what the four mystery pieces actually are, I might not recognize other pieces that belong with them! So, interwebs, what say you? Can you help a newbie weaver out? What are these things? Your items are called “temples”, and they are used to stretch the woven ‘fell’ of your fabric to keep it as wide across the front beam as it is in the reed. The temple is moved forward frequently and does slow down the process. Most weavers don’t use them on narrow warps where it is easy to leave that extra weft on each pic by placing it at an angle with the fell. They are handy on wider warps or with stretchy yarns to keep the width even and reduce stress (and breakage) of the edge threads of your warp. Ask any question and an answer will appear. They can be expensive and some experienced weavers swear by them…you’ll be able to sell those you don’t want to keep. 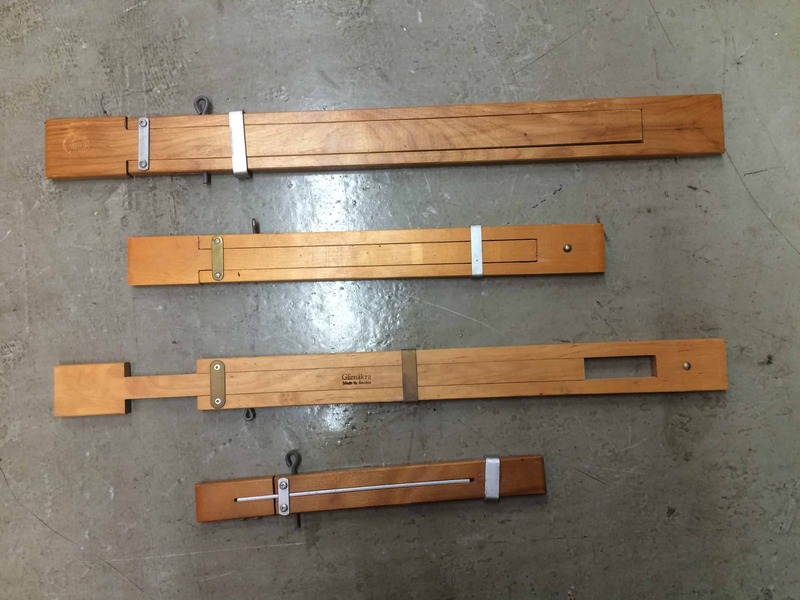 Because they are adjustable in width you don’t need many.